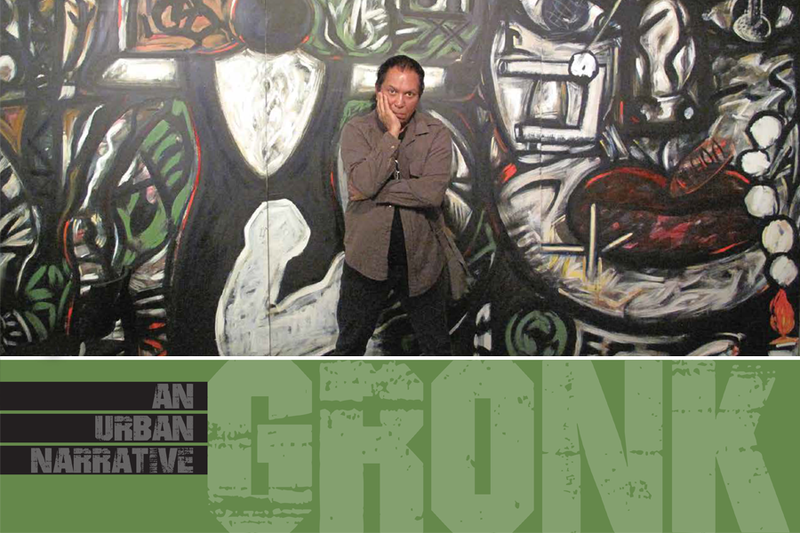 Arts UC Merced and the Merced County Arts Council present, “Gronk: An Urban Narrative.” Throughout the first half of October, 2014, Chicano contemporary artists created art in public view. Gronk (Glugio Nicandro) is a renowned Chicano painter, performance artist, and print maker. Gronk’s work has been widely exhibited in major venues such as the Los Angeles County Museum and the Corcoran Gallery of Washington D.C. The Smithsonian American Art Museum has included his works in the museum’s permanent collection. In his book on Gronk, Max Benavidez characterizes Gronk as a “hybrid voice that speaks in many artistic tongues: painting, drawing, graphic arts, murals, performance art (street, stage, video), photography, set design, ceramics, and computer generated animation." Gronk Nicandro is a set designer, painter, draftsman and artist based on downtown Los Angeles, California. In 1970 he became a founding member of the multimedia collective, ASCO. His body of work can be found in various museum collections across the world including UCLA Library, Vincent Prize Museum, Los Angeles County Museum of Art, San Francisco Museum Of Modern Art, Mexican Museum of San Francisco, and National Hispanic Cultural Center of Albuquerque. As a set designer he has collaborated with Director Peter Sellars on operas in Perm, Russia, Teatro Real in Madrid, Spain, Santa Fe Opera in Santa Fe, New Mexico, and Ojai Music Festival, in Ojai California. Gronk collaborated with Professor Ramicova on two opera projects: Griselda and The Indian Queen. "Acclaimed artist Gronk shares his work with Merced audience."